Ian Cutler, left, opened Cutler’s Artisan Spirits in Santa Barbara’s trendy Funk Zone development last year, He’s produced white spirits like gin as his bourbon ages. His un-aged white whiskey will be on the market next month. Photo courtesy Cutler’s Artisan Spirits. 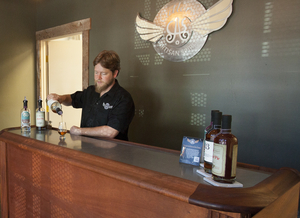 It’s one of hundreds of new distilleries that are popping up all over the country. As of last year, there were more than 450 independent, craft distilleries in America, according to the American Distilling Institute, which keeps track. A decade ago, there were fewer than 40. And a decade before that? About 10. Cutler knows the long odds. 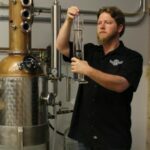 He spent a half-dozen years preparing for his new role as micro-distiller, traveling through Scotland, Kentucky and Tennessee looking to learn what makes good distillers good, and bad ones bad. “I spent equal time trying to understand what good distilleries do well, and what poor distillers are doing poorly, and really tried to distinguish between the two,” Cutler said in an interview with Bourbon Story Magazine. He has the right kind of background to understand whiskey at the molecular level – something he shares with a lot of Kentucky’s most famous old-school distillers. Like Maker’s Mark founders Bill Samuels Sr. and his wife Marjorie, to cite just one storied pair, Cutler has degrees in science – a bachelors and master’s in chemistry – to help him understand the whiskey he makes. Degree or no degree, he says everyone who would join him in the crowded craft distillery movement should take the same first step: Go to whiskey school. It also helped him learn which whiskeys tasted right to him – and how they got that way. ***Cutler looks a bit like The Dude, Jeff Bridge’s cocktail-loving character in The Big Lebowski, but his focus is all on the booze, not the bowling. 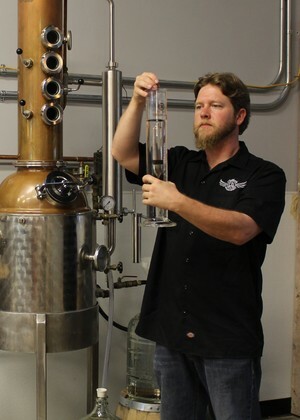 He moved to Santa Barbara 14 years ago to attend university, and along the way he’s become a walking compendium of all things distilling. He told Bourbon Story that his goal is create quality bourbon with the whiskey he’s put down to age. But in the meantime, he’s making a lot of other things along the way to pay the bills while his favorite whiskey ages. That’s because bourbon, or any bourbon that wants to call itself ‘straight bourbon’ anyway, takes at least two years to age–and many of the best bottles have spent a lot longer than that in the barrel. That poses a challenge for start-ups. For now, his bottles are available only in California, and mostly near the central coast area that includes Santa Barbara. That’s okay with him for now, he said. Ian Cutler’s family history is full of hooch. 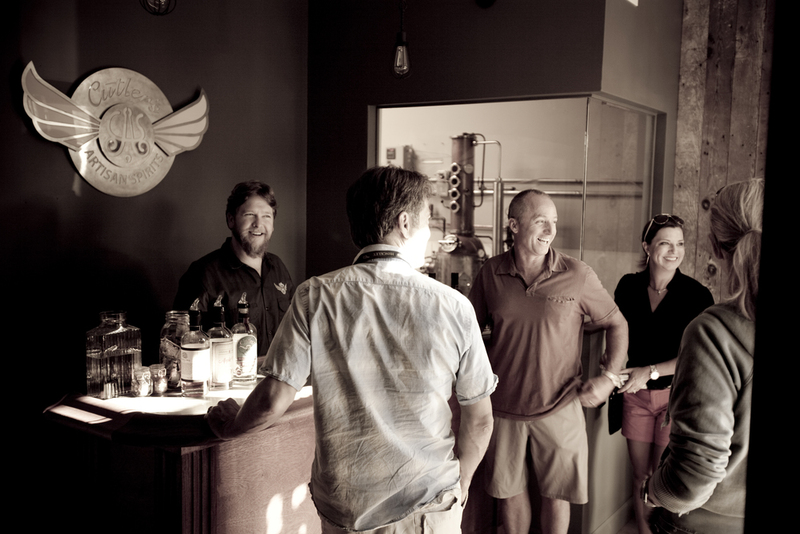 His is the first licensed distillery in the Santa Barbara area since Prohibition. Photo courtesy Cutler’s Artisan Distillery. 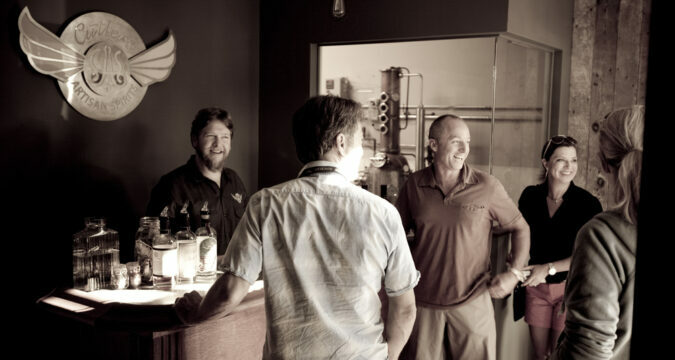 Ian Cutler pours a dram at his tasting bar and craft distillery, Cutler’s Artisanal Spirits in Santa Barbara. Photo by Tara Jones, used with permission by Noozhawk.com. For the hundreds of craft distilleries in the U.S., the roadblocks to success don’t end with the special challenge of bourbon’s aging requirements. Banks and bureaucracy are two other roadblocks that must be surmounted before you can turn on the first burner. Finding capital might be the single largest issue facing the fledgling industry today. Let’s be honest, banks don’t like risks, they avoid them like a mother around sharp objects. They get very nervous. Since so many craft distillers are so new, and since even together they produce less than 0.5 of the country’s spirits, the industry’s track record is too thin for most banks to back brand-new bourbon producers. Craft brewers faced the same issues for years; it was not until the last 10 years that banks began to love them. The best way to fund an operation is to find a whiskey drinker with money to spare — not that easy. Or raise funds through family, friends and yourself. Ian saved for several years to be able to finance his own start up. Another challenge? Dealing with government licensing. That can be as much fun as a glass of tepid whiskey on a muggy afternoon. Dealing with four different, and distinct levels makes it all that much more fun. To successfully distill you usually must get approval from city, county, state and federal officials — that is a lot of red tape. Some states are more helpful than others. 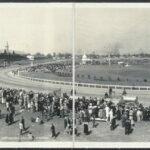 Oregon, for instance, recognized as far back as 2008 that the same pressures that had led to its microbrewery explosion were going to push entrepreneurs into the spirits business, too. It has a helpful guide to get started. Cutler suggests patience and to think like a teacher. “When I first approached the Santa Barbara City Council, one of the members pulled me aside and told me he liked the idea, but it would never pass. He said the city was just not ready for it. It took him about a year and half to get all of his licenses and permits in line. If banks and bureaucracies are two challenges for the novice distiller, another is lack of preparation. 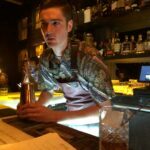 Don’t just go to whiskey school, Cutler advises, do your homework too. Too many individuals have visions of grandeur, he said. 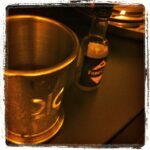 They will be the next Hudson Whiskey – small brand that has big success. Not every micro-distillery born in the past few years has followed Cutler’s slow-going, bootstrapped approach. 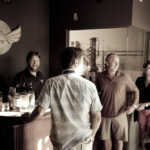 Take Watershed Distillery, founded in 2010 in Columbus, Ohio. Founder Greg Lehman and partner Dave Rigo finally got a business plan they could live with by 2009, and sold 20 percent of their company to investors for $250,000, Lehman told a Columbus business newspaper the following year. They kept their day jobs but he said they opened for business Sept. 1, 2010 and had gin and vodka on sale by the bottle by Dec 1. They’ve since expanded production with a new, larger still and, in late 2012, began selling the first-ever bourbon produced in Central Ohio. Cutler’s own path from clear spirits to bourbon is slower perhaps than the one Watershed and its investors have taken. But he’s comfortable with the pace he’s chosen. The hard work and risks he’s taken pay off in the faces of his customers, he said. Hudson Lindenberger (@hlindenberger) is the Colorado editor for Bourbon Story Magazine. Reach him with ideas, compliments and complaints at hplindenberger@gmail.com.